On many days throughout the year, crane operators roll up to jobsites without knowing who will be giving the signals, nor what type of signals will be used. The lack of relationship between the operators and signalperson compromises the safety of the jobsite; especially if proper task training has not been completed. In order for any jobsite to run safely, the operator and signalperson must be synchronized throughout the various tasks on the job. The best way to accomplish this is to ensure that the lift director, operator and signal person conduct a pre-lift meeting. This time should be set aside as a first priority to address signal use, as well as any special instructions that may be required to safely complete the task. Throughout the history of signaling operators, many different forms of hand signals have been used according to the trade. Expecting crane operators to understand and differentiate between signals accurately from trade to trade is the antithesis of promoting safety on the jobsite. For many years, the job of signalperson was given to the new person on site, or another individual who was not trained to perform the work needed when the load was landed. But the signalperson also did not have the necessary training on performing the correct signaling functions either. This led to operators struggling to decipher hand signals through trial and error. For this reason, OSHA, ASME and other regulatory agencies have standardized hand signals that are to be used universally, no matter the trade. The standardized hand signals shall be understood by the operator and signalperson and be posted on the crane, as well as on the jobsite. However, there is an allowance for specialty signals to be implemented, only in the event that the person in charge of the lift, operator, and signal person have agreed on the specialty signal during a pre-lift meeting, and each have a complete understanding of the specialty signals. Voice signals pose an entirely different hazard between the operator and signal person. On many jobsites operators must try to understand the signal person due to a language barrier. For this reason, OSHA says that all operators and qualified signal persons must ensure the language being used is agreed upon and understood by both. If, at any time, an operator does not understand the signal given, they are to safely stop all operations until the signal is clearly understood. Recently, I was discussing with a certified operator his perspective on the relationship between a signalperson and operator. He explained to me that there are signalpersons that he has complete trust in and those he has no comfort level with. When a trusted signalperson gives him a signal, he believes the load will be in control throughout the entire lift, and will be placed in the correct position. However, with a signalperson who he is uncomfortable with provides a signal, he feels the need to double-check the rigging configuration himself, as well as to confirm exactly what signals they plan to use. The operator explained that far too often the signalperson does know what each hand signal is, but has no concept of how they apply to the dynamics of a crane. This is only one example of many similar stories I have heard throughout the country. The standard also addresses the proper application of each signal that can be used. For example, voice signals are to be continuous, without interruption. If a verbal communication is interrupted, the operator is required to safely stop all movements of the crane until communication is restored. ASME B30.5 states that when a signalperson is giving voice signals, the signal information should contain three elements: function and direction, distance and/or speed, and function stop. 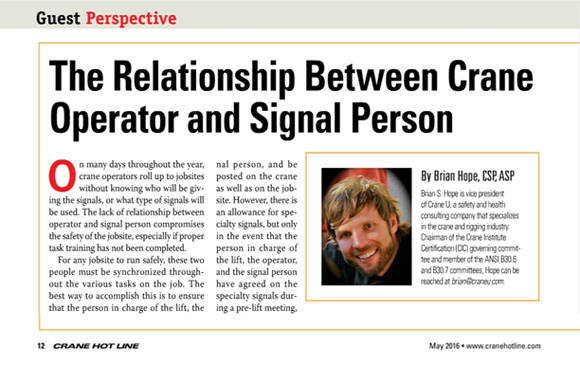 The relationship between a crane operator and signalperson is primarily based on trust. Trust is earned over time, not given in a day. The crane operator is more often than not, “flying in the dark” with his sole reliance of direction and load placement in the hands of the signalperson. One analogy I use in our Rigger/Signalperson class to clarify and emphasize the important role of the signal person, is for the signalperson to imagine they are helping a blind person drive a car down the street. In essence, this is what they are doing when signaling a crane operator. Would the signalperson tell a blind driver to stop just as they reached a stop sign? Or would they rather provide the driver with an advanced directive to slow down steadily as they made their approach? Would the signalperson tell them to turn left at the exact moment they reach a crossroad, or would they give early notice to the driver that a left turn is up ahead? This analogy provides the best explanation for how an operator feels when they are relying on a signalperson to be their eyes and ears in the air. 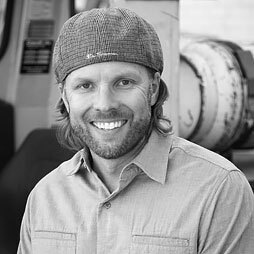 The more trust an operator has with the signalperson, the safer and more efficient the job will be. As with many jobsites, there are exceptions to different types of signals and how those signals will be given. The key to any successful job is open communication between the person in charge of the lift, the operator, and the signalperson.